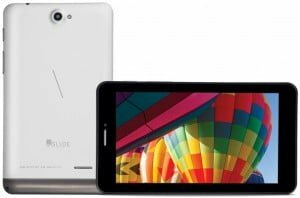 Display: The iBall Slide 3G 7271 HD 7 tablet comes with a five point multi touch display of 7 inches that provides a resolution of 1024 x 600 pixels. Processor: This tablet has been equipped with a Cortex A7 dual core processor of 1.3 Giga Hertz. Software: iBall Slide 3G 7271 tablet functions on Android 4.2 Jelly Bean platform. Memory: This device features a RAM of 512 MB and internal storage space of 4 GB. It also provides expandable memory option with the help of a micro SD card. Camera: iBall Slide 3G 7271 device comes with a primary camera of 2 mega pixels with LED flash and a front facing VGA camera of 0.3 mega pixel for making video calls. Connectivity Features: The connectivity features incorporated in this device are GPS, Wi-Fi, Bluetooth and 3G. Other Features: iBall Slide 3G 7271 is a dual SIM tablet with dual standby feature. It also offers wireless FM Radio and a 3.5 mm AV jack. Battery: This device works on a battery of 3000 mAh capacity. Our Take: The iBall Slide 3G 7271 HD 7 tablet comes with some pretty decent and interesting features. At such a price, it is good tablet for customers with a tight budget. The iBall Slide 3G 7271 HD 7 tablet is likely to experience good sales and fare well in the market.